Enamel paint is a term that is used to reference a paint with a hard, glossy and opaque finish. In actuality, the term “enamel paint” does not necessarily have a generally accepted or standardized definition, but historically, enamel paint has been used to refer to any type of enamel paint that is oil based and with a considerably glossy finish. However, due to the rising popularity of latex and water based paints, the term enamel paint has since evolved to refer to a hard surfaced paint with a high gloss finish. In addition, the term is used to refer to enamel paint brands that are high in quality. Commercial enamel paints have been used in artwork by many famous artists over the years. Pablo Picasso is one such artist who is known to have used a commercial paint by the name of “Ripolin” that is not even meant for use in artwork. Sidney Nolan is another artist who used enamel paints in his work. One such piece that he created using enamel paint is “The Trial” dating back to 1947. Hermann-Paul is yet another artist known to have use enamel paints in his work. Due to this preference of enamel paint by artists, some manufacturers have made available enamel paints that are distinctively for use in the art world. Enamel paints are characterized by their hard, washable and glossy finish and are available with heat resistant properties. They are available in several types, including oil based or alkyd based, which have the features of slower drying times in addition to being harder than that of water based enamel paints. Oil based paints are recognized by their distinguishable solvent odor properties and are easily cleaned using paint thinner or mineral spirits. Additionally, quite a few manufacturers now add varnish to oil based paints. Water based paints, which are also referred to as latex or acrylic paints, are much easier to work with. They have the benefits of ease and simplicity of use, quicker drying times, easily cleaned using water alone and have a much weaker odor. Enamel paints are also available in urethane or polyurethane which are both offered in a water or solvent base. Enamels are available in a wide spectrum of colors and a number of sheens, including eggshell, low luster, satin, flat finish, gloss, semi gloss and high gloss, among others. Specialty enamels, used for specialty type projects such as painting appliances, are also offered and frequently have the benefits of quicker drying times. Enamel paints are highly functional and have a number of uses. A glossier paint will be tougher and more durable after it has dried and so enamel paints are perfect for coating surfaces that must endure high traffic, humidity and dirty hands, such as those surfaces found inside and outside homes, in addition to use on heavy duty industrial applications. Enamel paints are commonly used around the house in areas such as trims, doors, in the bathroom, kitchen, for different types of flooring, stairs, basements, porches and patios, as these rooms and surfaces endure a high degree of abuse and variations in temperature. Enamel paints may be used on various surfaces around the house, including wood, metal, wicker, concrete, masonry, wrought iron, glass, plaster and ceramic, among others. Enamel paints provide excellent coverage and color retention. They provide surfaces with moisture, chip and corrosion resistance as well as rust preventive properties. They also allow for the repeated washing of surfaces without causing any damage to the surface. Furthermore, many enamel paints offer the attractive feature of mildew resistance for surfaces. 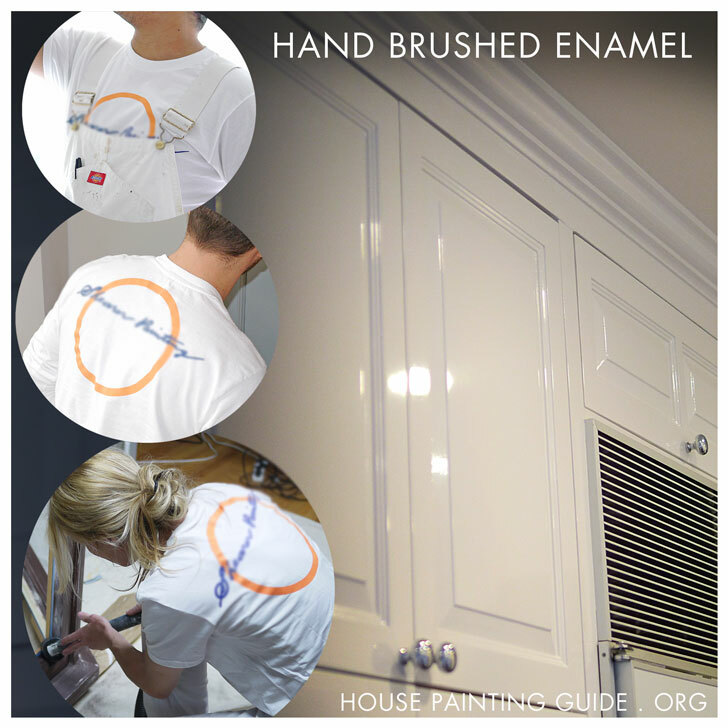 Other places in the home where enamel paint is commonly used include appliances, countertops and painted furniture. Fast dry enamel paint is great for these areas, as it is a popular type of paint that has a drying time of 10 – 15 minutes after application. High temperature enamel paint is also available and this is ideal for use on BBQs. In addition, enamel paint is great to use on wooden surfaces due to its waterproof and rot proof resistant properties. As a general rule of thumb, surfaces treated with enamel paint are more durable and are able to outlast any untreated surface. Enamel paints are a highly practical and popular choice for numerous projects around the home. Using enamel paint is very simple and easy and all that is required for application is a high quality brush, roller or spray type equipment. Consumers may experiment with the different application methods to find the one that provides the smoothest finish. Ultimately, the method of application will be dependent on the type of paint being used and the job at hand. It is crucial that the surface be prepared and cleaned thoroughly prior to applying the primer and that any old paint be removed. It is also important that the paint be thoroughly stirred immediately prior to application. As a general tip, a few thinner coats will provide a higher quality finish in comparison to a single or couple of heavier coats and be careful not to apply too much paint, as it will get too runny. In addition, read and follow the instructions provided on the label and prepare exactly as directed. This is extremely important as glossier paints have more sheen and a higher visibility of surface imperfections. It is recommended that a mask be worn when painting in small, confined areas and that areas be adequately ventilated, as enamel paint will give off toxic paint fumes. Enamel paint will naturally air dry and the drying time will vary in accordance with the type of enamel paint being used, the drying conditions and environmental conditions. Oil based enamels fully dry in 8 – 24 hours and dry on the inside first and then outwards. It is easy to tell when an oil based enamel has fully cured, as it will feel entirely dry when touched. On the other hand, water based enamels can take up to one full month to set and can be damaged during that time, so a high degree of care should be exercised when washing and handling. Water based enamel paints will dry on the outside first and then the inside. An outer covering will form on the surface and although the paint will feel dry to the touch in approximately one hour after application, the underlying paint will still be moist. Weather plays a hand in the drying time of the paint. When there is a high degree of humidity or it is on the cool side, the enamel may take up to several weeks to cure completely. There are many misconceptions surrounding enamel paints. One common misconception is in the marketing of washable water based flat paints as flat enamels. It is referenced that these come with limited or no sheen and with the durability and scrub ability of regular enamels. Technically, this is incorrect information as the majority of consumers automatically make the assumption that all enamel paints are washable, which is not the case. In addition, the term enamel paint is also something of a misconception, as the majority of enamel paints on the market are considerably softer than vitreous enamel and even stoved synthetic resins. Since the term lacks a definitive definition I’ve seen paint manufacturers use it for everything they make hoping people will think it’s a high quality paint when it’s not. In my haste to make some pre-holiday updates to my bathroom I’ve painted with an alkyd enamel paint. The fumes were so strong I started searching to see how toxic the fumes were, I now know what VOC means. Only it feels a little too late as I came across a site that indicated that this type of paint emits volatile VOC levels. I am highly concerned with three small children regularly using this restroom of long term impact. Would you recommend changing/removing paint? Sorry, just saw this, 2 years later! That’s a good question since paint curing on a wall emits far less toxins than when you apply it. THAT’S when it gets dangerous. But I’ve learned everyone has different tolerances to impurities in the environment. Some people even have a genetic predisposition to low tolerance of heavy metals in the body and need to be chelated while others in the same environment are not effected. To answer your question I would not try to remove that since that will introduce a lot of airborne contaminants. I’d just paint over it with a zero VOC paint to seal in the volatiles. Ask your Sherwin Williams store manager (not the CSR) what is the best for that purpose. Thanks for the nice and informative post…..Will look for more updates on this..
Christo Javacheff used very often enamel in his preparing sketsches and collages for his big projects. Example: On the way to THE GATES Central Park New York. Thanks for your information on enamel. Will it help me to become a Picasso? That might be a bit too brittle for soft surfaces like texture. Water based wall paint has more give so is less likely to break when bumped. I am wanting to paint a tea kettle (meant to go on a stove with open flame). Tea kettle companies have beautiful shades of high heat paint they use- but I cannot find out what exactly they use. The only high heat paint I can find is spray paint in a handful of horrid colors…whereas I am wanting to do something with multicolors and hand painted motifs. Can anyone point me in the direction of a high heat craft enamel paint? Should they be used as n galvanized metal? Your article was very informative; thank you! What kind of paint can we use on a wall that gets up to 300 degrees? Will regular enamel paint work? We put in a linear gas fireplace and the wall above it gets up to 300 degrees. I’d give it one coat with the primer and one coat of the paint, or two if one doesn’t cover. If the primer is tintable you might want to tint it dark gray if the topcoat is a dark color and light gray if the topcoat is going to be a light color. You will have a better chance at one coat coverage if it’s gray-primed instead of primed white. Make sure you have them machine shake your cans since they’ve been lying around. Next post: Oil or Latex Paint?